Hudson Chocolates creates, arguably, one of the most innovative chocolates I’ve encountered in recent years. 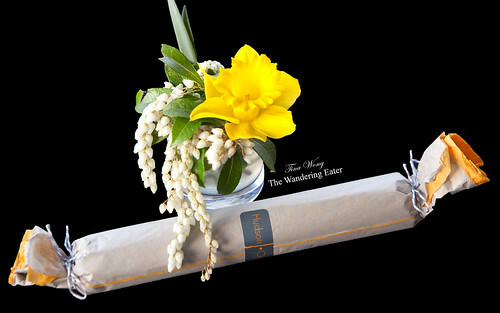 They use high quality chocolates in various cacao percentages and high quality, locally sourced, fresh ingredients. What makes this brand innovative is by the shapes, flavors, and textures of the chocolates. Hudson Chocolates co-owned by Francisco Migoya and his wife. 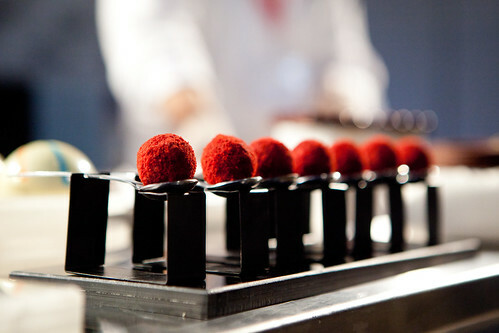 Mr. Migoya is a well respected pastry chef who had worked in prestigious restaurants like The French Laundry. He became an Associate Professor at the Culinary Institute of America (Hyde Park, NY) in 2005 and in 2011, Migoya was named one of the “Top Ten Pastry Chefs in America” by Dessert Professional Magazine. 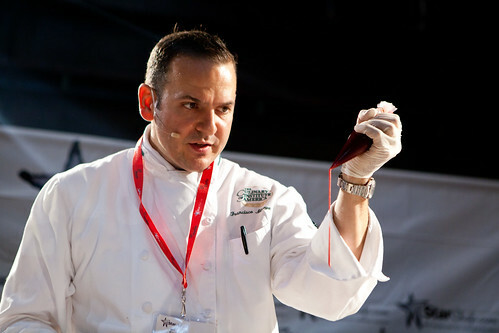 Migoya really captivated me when I watched his demonstration at StarChefs International Congress 2012. 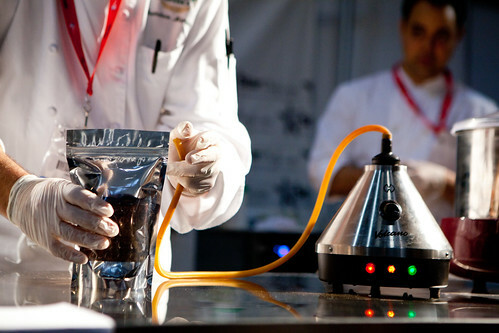 The almost unthinkable techniques like using a Volcano vaporizer to infuse scent into chocolate bars, having brioche in a chocolate bar, red velvet chocolate truffles that has a liquid red velvet center, and the list goes on. My mind was blown away when I actually ate a few of his items. But back then, he did not start Hudson Chocolates yet and I kept him in mind and followed him on social media about any updates on his chocolate shop. He finally set up shop and when I read on Hudson Chocolate’s Twitter that there Doughnut Bar is available for sale earlier this month, I didn’t hesitate to go online and order a few things. 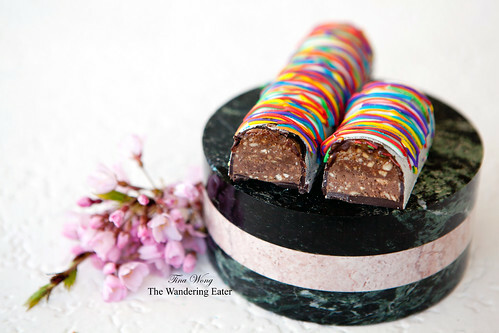 When I looked at my sunflower seed praline with malted milk ganache ($24) wrapped in layers of wax and colored paper, I thought this looks kind of ordinary. (I should note his shipping packaging is pretty darn smart with this inflated bubble pyramid-shaped bag to protect his creations.) 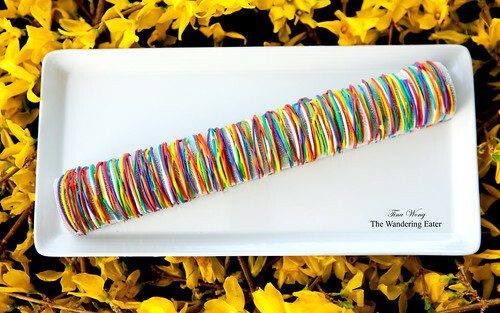 Once I removed the papers, I was in awe by the vibrant, strings of rainbow colored chocolate that coated this praline bar. I learned quickly that these ganache filled bars are not flimsy when I tried breaking them with my hands. I had to utilize a hot knife to slice them apart. When I got to eat it, it was delicious. Crunchy, nutty with an undercurrent of milk chocolate that worked wonderfully with the malt. The malt powder rounds out the flavors perfectly. Now about that doughnut chocolate bar ($24). This is not your typical chocolate bar as it weighs in about 1.7 pounds and it’s in a beautiful gray box contrasted with bright orange panels. The ganache of this bar is a blend (literally) of cake doughnuts, cooked in fresh Hudson Valley heavy cream, with a touch of cinnamon and vanilla bean that has a center of raspberry gelée. 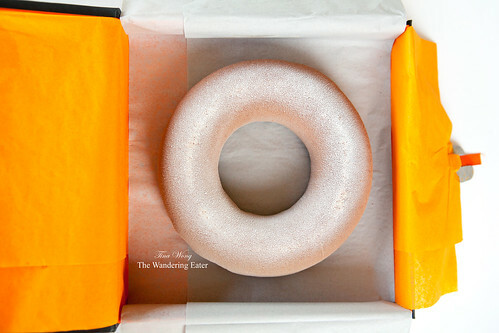 Then it is set in a medium thick, milk chocolate shell and lightly covered in a matte white chocolate spray. It looks like a doughnut and it tastes like a creamy cinnamon, raspberry jelly, chocolate doughnut. It’s crazy and I absolutely love it, especially with a cup of coffee. Frankly, a little piece goes a very long way. If you are a greedy chocoholic like I am, there’s a potential case for a tummy ache but it’s well worth it. If you have the opportunity to visit Hudson Chocolates, I highly recommend it but if you can’t for logistical reasons, order from them. It’s seriously delicious chocolates but it has humor and a fun personality at the same time (see the This Little Piggy). I can’t wait to see what other chocolate concoctions the Migoyas would think of and I’m officially a fan of their chocolates. 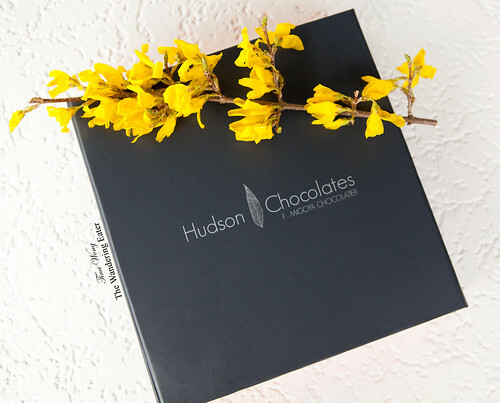 Thanks for writing about Hudson Chocolates! I live a half mile away and it’s proving dangerous for my waistline, but OH SO GOOD. Can’t wait for the Donut Bar! You’re welcome! They are dangerous to your waistline but it’s so worth hitting the gym or the pavement (if you run/bike) harder! wow – I love chocolate – would love to try that chocolate doughnut!